My new Windows 7 Professional notebook comes with an application called PowerShell ISE (make sure to run the ISE version; the unmarked one is more like DOS and has the same problems noted below). The “ISE” is for “integrated scripting environment”. It defaults to Consolas font, which looks a lot like Lucida console. This’ll set the DOS character encoding to be UTF-8. Before writing to System.out, Java’s constant for the standard output, you’ll need to set it up to use UTF-8. It’s a one-liner. The true value enables auto-flushing, which is a good idea for standard output. Here’s a simple test program (the backslash escapes are Java literals for Unicode code points). You can see the output in action in the screen dumps at the top of this post. The DOS shell will let you set the character encoding and change the font to Lucida console. But it oddly duplicates characters at the end of lines if the lines contain non-ASCII code points. You can see this on the example. And it can’t handle the Tamil or Han characters. 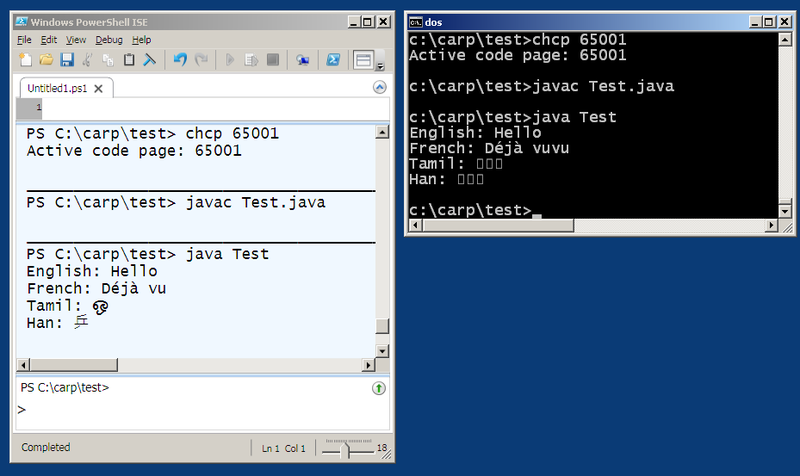 This entry was posted on July 6, 2010 at 6:27 pm and is filed under Carp's Blog, Java, LingPipe in Use. You can follow any responses to this entry through the RSS 2.0 feed. You can leave a response, or trackback from your own site. Having said all this, the BASH shell on Linux (relatively recent Ubuntu) does a great job of handling and rendering Unicode. The GNU Emacs version lets you paste into it, but doesn’t do such a great job at rendering. Anyone have any idea how the Mac handles Unicode in its shell and text editors? I get an “Already running command. Please wait.” message which does not let me type and enter an input. No idea. I’ve never used the Scanner. Have you checked to see if there’s another Java process running on the machine that may have grabbed your resource? CMD.EXE, NetBeans, and Eclipse all let me run and enter input, but only the Windows PowerShell ISE pauses where there is supposed to be user input and says “Already running command. Please wait.” in the status bar. Maybe Windows PowerShell ISE thinks that whatever I am typing is a PowerShell command and wants me to wait until java.exe is done executing? Have you tried to retrieve user input in Windows PowerShell ISE? Maybe not Scanner, but maybe there is another way which works? Looks like user input in Windows PowerShell ISE is unsupported. All “start java …” does is pop up a regular CMD window.